FILE - People stand near a dead body, after what rescue workers described as a gas attack in the town of Khan Sheikhoun in rebel-held Idlib, Syria, April 4, 2017. Senior U.S. military officials said Friday that they were looking into whether Russia aided Syrian forces in this week's deadly chemical attack on civilians in Idlib province. "We think we have a good picture of who supported them as well," one senior military official told reporters at the Pentagon, adding that the Pentagon was "carefully assessing any information that would implicate the Russians knew or assisted with this Syrian capability." The officials said that at a minimum, the Russians failed to rein in the Syrian regime activity that has killed innocent Syrian civilians. They said Russia also failed to fulfill its 2013 guarantee that Syria's chemical weapons would be eliminated. The U.S. military officials noted that they had not seen evidence of Russian involvement in the chemical attack. However, the officials said the Russians had an aviation unit based at the airfield where the attack originated and have "chemical expertise in country." U.S. military officials have shown reporters the Syrian aircraft flight path that was taken April 4 from al-Shayrat airfield to the town of Khan Sheikhoun, where more than 80 people were killed in the attack that local doctors said involved sarin nerve gas. U.S. military officials said Friday that after the attack, they watched a small drone, also called a UAV, flying over the hospital in Khan Sheikoun where victims of the chemical attack were being treated. "About five hours later, the UAV returned, and the hospital was struck by additional munitions," one official said. The senior military official said the U.S. did not know why the hospital was struck or who carried out the strike, but had determined that it was potentially done "to hide the evidence of a chemical attack." Meanwhile, senior military officials said the United States and Russia would maintain a line of communication aimed at preventing midair collisions of their warplanes in Syrian airspace. That contradicted Moscow's earlier assertion that it had suspended those communications in protest against the Tomahawk cruise missile strike on al-Shayrat airfield. The communication line is primarily used to ensure that Russian and U.S. planes conducting combat missions in Syria do not get into unintentional confrontations. The U.S. is using the airspace to conduct strikes against Islamic State terrorists. The U.S. used the line to inform the Russians of the intent to strike in order to warn any Russians who were at the base, officials said. FILE - The USS Ross fires a Tomahawk missile, April 7, 2017. The Ross is conducting naval operations in the U.S. 6th Fleet area of operations in support of U.S. national security interests. Friday's U.S. strike used 59 Tomahawk cruise missiles to hit targets on the Syrian airfield, including about 20 aircraft, aircraft storage facilities, ammunition supply bunkers and radars, officials said. A U.S. military official told VOA there was an area on the airfield known to have been used as a chemical weapons depot. The source said that the U.S. military did not know whether chemical weapons were still in that area, but out of an abundance of caution to avoid potential casualties, the missiles did not strike that area. Other U.S. military officials told VOA the strikes did not target the airfield runways so as to not threaten Russians, adding that the Tomahawk type used was for "precision strikes, not cratering." One military official deemed the strikes as "appropriate, proportionate, precise and effective." 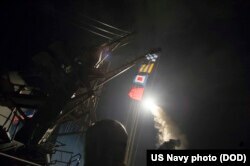 The office of Syrian President Bashar al-Assad described the strikes in a statement Friday as "reckless" and "irresponsible." The statement added that the attacks were "shortsighted" and a continuation of a U.S. policy of "subjugating people." Russia, which is providing troops and air support to the Assad government, condemned the U.S. military action, calling it "aggression against a sovereign state," and said it was suspending a memorandum of understanding with the U.S. for flight safety over Syria. U.S. Ambassador to the United Nations Nikki Haley said Friday that the United States "took a very measured step last night." She added, "We are prepared to do more, but we hope that will not be necessary."